The band performance times, festival experiences, an after-party, and additional food & beverage details have been announced for the 7th annual Monster Energy Aftershock, returning to Discovery Park near downtown Sacramento, CA, Saturday, October 13 and Sunday, October 14. 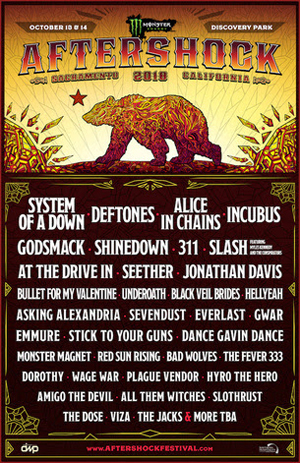 California's biggest rock festival will feature performances from SYSTEM OF A DOWN (celebrating the 20th anniversary of their landmark self-titled first album), DEFTONES (headlining their hometown for the first time in seven years and celebrating their 30th anniversary), Alice In Chains, Incubus, Godsmack, Shinedown, 311, Slash featuring Myles Kennedy And The Conspirators, At The Drive-In, Seether and many more. All VIP and hotel packages and weekend general admission tickets for Monster Energy Aftershock are sold out. However, a limited number of general admission tickets for Saturday, October 13 are still available at www.AftershockFestival.com. Anyone with a weekend pass or single day Saturday or Sunday ticket will be allowed free entry on a first come, first served basis. Fxck Cancer/Dyin 2 Live: Fighting cancer by raising awareness and to educate about early cancer detection. The Dyin 2 Live wish-granting program looks to enrich the lives of those fighting cancer by offering them an experience that will bring joy, hope, inspiration, and courage into their lives. Kolas: Kolas represents a lifestyle and culture for anyone ready to take their passion for cannabis to the next level. Swing by the Kolas booth for some fun swag, great industry information and promotions from leading brands, and other surprises you won’t want to miss out on. Zippo: Offering a full stock of Zippo lighters, including limited-edition festival designs. Visit early every day for a chance to get access to some of the best “seats” in the house, the Zippo Hot Seat! The official Monster Energy Aftershock mobile app will be available for download starting September 25. Attendees can build their own schedule, learn more about the artists and personalities appearing at the festival and get the latest must-know information through push notifications. Download it through the Google Play and Apple stores. As previously announced, in addition to performances from top music artists, Monster Energy Aftershock will also feature a variety of onsite food and beverage experiences. Beverages: Festivalgoers 21+ can enjoy a variety of beverages at one of the festival's many bar locations. Specialty experiences include Caduceus Cellars & Merkin Vineyards Wine Garden (owned by Arizona resident Maynard James Keenan, co-founder of international recording acts TOOL, A PERFECT CIRCLE and PUSCIFER) and the Belching Beaver Bar (featuring drafts from the Vista, California brewer, including the popular Phantom Bride IPA, a collaboration with DEFTONES). Coors Light and other beverage options will also be available throughout the festival grounds. Monster Energy Aftershock is fueled by Monster Energy. Additional 2018 sponsors include f.y.e., Coors Light, Zippo, The Music Experience, Fxck Cancer, Take Me Home, Thunder Valley Casino Resort, Belching Beaver, Caduceus Wine, Heavy Grass, The Stash, Blackcraft Cult, Fearless Records, Roadrunner Records, Ace of Spades, Kolas, Cyco Flower Nutrients, Warner Bros. Records, Captain Morgan, Don Julio, Smirnoff and Bulleit Bourbon. Monster Energy Aftershock is produced by Danny Wimmer Presents, a producer of some of the biggest rock festivals in America, including Rock On The Range, Bourbon & Beyond, Welcome To Rockville, Monster Energy Aftershock, Carolina Rebellion, Chicago Open Air, Monster Energy Rock Allegiance, Northern Invasion, the recently announced Sonic Temple Art + Music Festival and more.